The icon means there is a Things to do section of questions to start your own investigations. Why does the Golden Ratio (Phi) appear in plants? The rational answer is an irrational number! The seeds are given numbers from 1 up as far as you want to go. Look out! There's the teacher: 30 metres at 3 o'clock! where the axis of 12 o'clock is straight ahead. So we need a centre point or origin and a fixed line through it as an axis to measure the angles from. A point is then uniquely identified by its distance r from the origin and its angle theta measured as a rotation about the origin from the axis. so for example, seed s = 9 is 9 phi = 9 × 0.61804 = 5.5624 turns. Since a whole turn takes us back to the starting direction, we can ignore the whole-number part and all we need is the fractional part 0.5624 of a turn but it does no harm to use 5.5624 either. Most computer languages use a graphing system with x and y axes called cartesian coordinates. They also provide functions on angles where the unit of angle is a radian that is, an angle is measured by the distance it makes around a circle of unit radius. Because a unit circle has a circumference of 2π, there are 2π = 2 3.14159267... = 6.2831853... radians in one complete turn. Now plot your seeds on an x-y graph using the cartesian coordinates for each seed. By multiplying the seed number by a different ratio to get its angle, you can experiment and see what seed heads would be like if nature used a different value for its turns-per-seed value too. Click on the thumbnail images or links to open a demonstration in a new window. Depending on your browser, you should be able to move the slider to any part of the movie to view individual frames and values near phi. This Excel spreadsheet employs a slider to alter the turns-per-seed on an interactive chart to show that 0.61804 is better than 0.61803 or 0.61805 in terms of the evenness of the distribution of 2000 seeds on a seedhead. A smaller view of the innermost 50 seeds is given as well. It does not use Macros so disable them if asked when you load it. 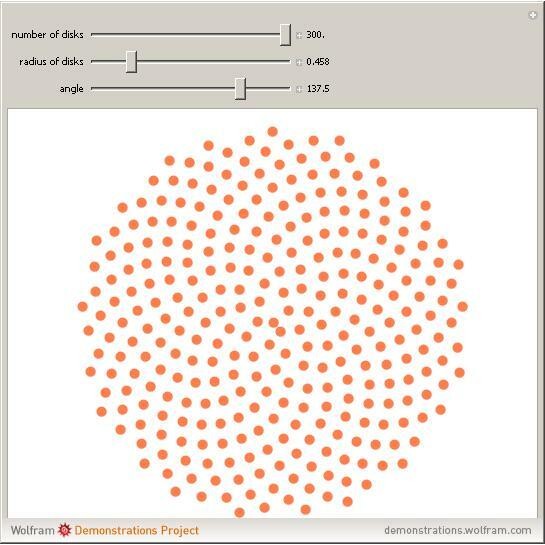 There are some nice interactive phyllotaxis demonstrations made with Mathematica from Wolfram Research in their Demonstrations Project. Each can either be viewed without Mathematica in a browser page (as a movie of the demonstration) or by downloading the free Mathematica Player in which case the demonstration is fully interactive. Waterloo Software's Maple is another professional mathematics package similar to Mathematica. The Maple code here illustrates the algorithm used to generate a diagram of seeds with a given number of turns-per-seed. Geometer's Sketchpad is available as a free trial for PC and Apple Mac for teachers and administrators. Phyllotaxis, anthotaxis and semataxis Acta Biotheoretica Vol 14, 1961, pages 1-28. Phyllotaxis: Its Quantitative Expression and Relation to growth in the Apex Phil. Trans. Series B Vol 235, 1951, pages 509-564. Eric W. Weisstein's page on Phyllotaxis has some more references to books and articles.